In honor of Cyber Monday, I'm giving away copy of Beautiful Wire Jewelry for Beaders (book 1) by Irina Miech today! 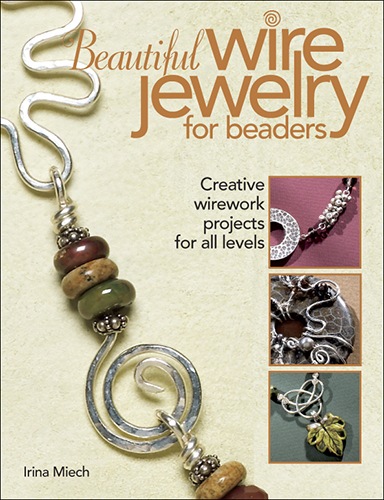 This book is full of fantastic wire jewelry designs that incorporate beads! Full of beautifully photographed, step-by-step instructions, Irina shows you how to create lots of wonderul wire jewelry designs and how to include a variety of stunning beads, crystals, donuts, focal pendants, cabachons and more! And, although designed as an introduction to wirework, Irena's designs, tips and techniques are not just for the beginner, but for the advanced wire and bead artist as well. Her new book, Beautiful Wire Jewerly for Beaders 2 is also available and worth your purchase, but I thought I'd my treat my blog readers and Facebook Fans to a copy of this one for free! All you have to do to enter for your chance to win, is become a follower here on my blog and also "Like" my MiShel Designs Facebook Fan Page by going to www.Facebook.com/MiShelDesigns and then enter a post on FB letting me know exactly why YOU should be the recipient of this fabulous book! I'll choose a winner tomorrow morning, Tuesday, the 30th, and announce it on my MiShelDesigns Facebook Fan Page, of here too, of course! So, go enter now and good luck to you all! Peace, Love and Free Stuff on Cyber Monday!! Hi Michelle, would love to win a copy of the book. I am already a follower. Talk to you on FB. Happy Cyber Monday!